Part I (M. Ku&zcaron;vart). 1. Introduction. 2. Industrial types of mineral deposits. 3. Geological criteria for ore prospecting. 4. Geological prospecting methods and indications. 5. Remote sensing in the search of mineral deposits. 6. Phases of prospecting. 7. The geological prospecting-exploratory works on mineral deposits. 8. Geochemical prospecting methods. Geophysical methods of prospecting for and exploration of metallic, non-metallic and coal deposits (J. Gruntorád). 10. Case histories of prospecting and exploration. 11. Prospecting and exploration of oil and gas deposits (V. Homola). 12. Prospecting for and exploration of mineral raw materials of seas and oceans. Part II (M. Böhmer). 13. Preliminary and detailed exploration. 14. Methods of subsurface exploration. 15. Exploratory systems. 16. Categories of mineral reserves and degrees of geological assurance of the deposit. 17. Sampling. 18. Geological documentation of mineral deposits. 19. Hydrogeological and engineering-geological investigations of mineral deposits (I. Mucha). 20. Exploration during mining operations. 21. Prospecting and exploration of placer deposits. 22. Reserves calculation. 23. Economic evaluation of mineral deposits. 24. Literature. 25. Index. This is the completely revised edition of a book which was published in 1978 and, such was its popularity, was sold out within two years. It was described as An excellent compilation and condensation of a vast field of literature and experience in economic geology. Clear illustrations, charts and tables punctuate the text material very nicely... Valuable for all economic geologists and resource developers.'' (Choice). The material is illustrated by 215 text figures and 76 tables, and is presented in two parts. The first part covers the geological background of the genesis of mineral deposits as a clue to new discoveries, and the methods of geological, geochemical and geophysical prospecting. 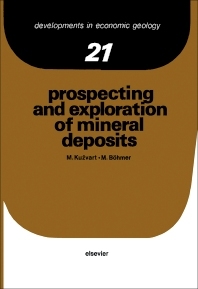 The second part concerns sampling, documentation and computation of ore reserves and economic assessment of mineral deposits. This new edition has been very extensively revised and brought up to date. This holds true particularly for the chapters on geochemical and geophysical methods, the use of photo-geology and satellite imagery, oil and gas prospecting, exploration of underwater minerals, the application of the principles of global tectonics in prospecting for deposits, and the evaluation of reserves. These new or thoroughly revised chapters comprise almost half of the entire text.